A crêpe is a very thin pancake, usually made from wheat flour. These French street-food staples are easy to make and can be served with a variety of fillings both sweet and savory. Classic crêpes are made with a wet mixture of flour, eggs, milk and salt. A small amount of this thin batter is gently cooked in a butter greased pan till it turns lightly golden. 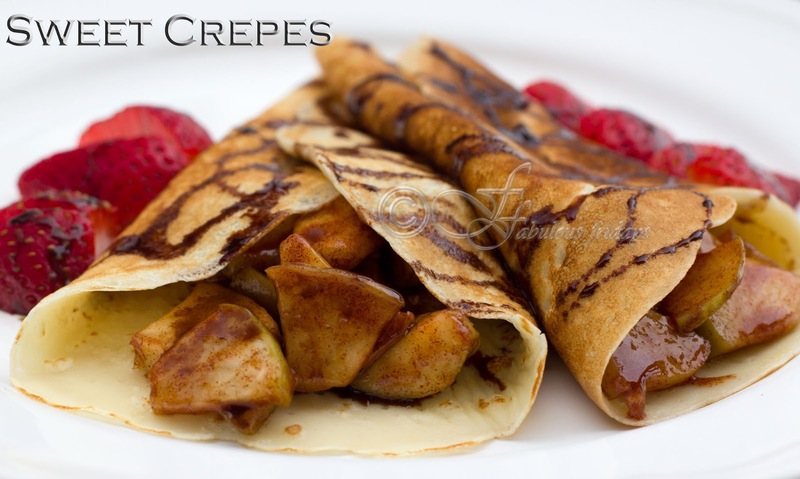 Breakfast and dessert crêpes are commonly filled with sweet fillings such as fruit, syrup, chocolate, whipped cream. The lunch ones can be more hearty and savory and stuffed with meats, cheese, eggs, veggies. Crêpes are a great way to turn left overs into a delicious meal. Use a different flour to make the shell for a taste variation - whole wheat, buckwheat, etc. 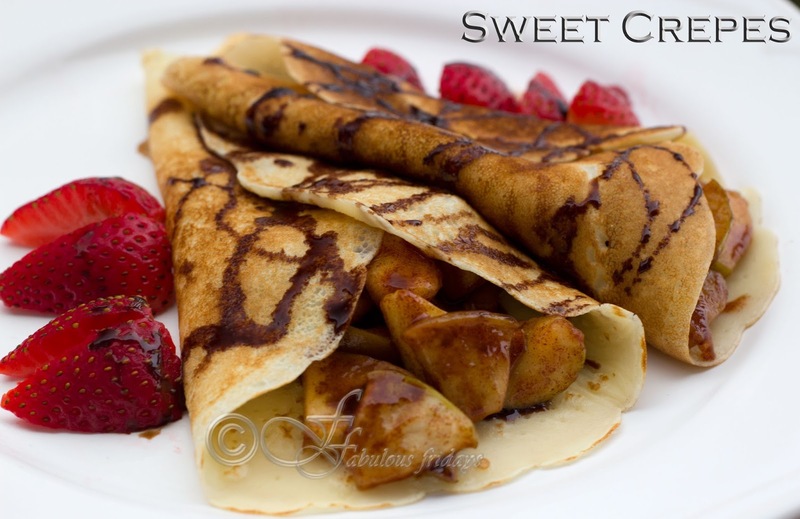 Here are some filling ideas for your sweet crêpes. Make the apple filling: Combine sugar, cornstarch and cinnamon with 1/4 cup of water and stir to dissolve. Add apples and lemon juice and bring to boil. Reduce to medium heat and cover. Cook until the apples have softened and liquid has thickened, about 3-5 minutes. Remove from heat and cool while you prepare the crepe shells. Make the crepe shells: Mix all the ingredients for crepes and whisk to get a lump free thin batter. Bring a lightly greased non-stick skillet to medium heat. Pour 3-4 tbsp of batter onto the pan and rotate the pan around so that there is an even coating on the bottom . Try not to run batter up the sides as this can over crisp the edges. Turn the crepe over after 30-40 seconds. It should be lightly browned on both sides. Plate your crepes and drizzle them with chocolate syrup. Serve warm. Optionally, serve with a dollop of lightly sweetened whipped cream or dust with powdered sugar.